If you are looking for a perfect reliable makeup artist for you, your search ends here! Glamovers Makeup Artistry is headed by Jyotsna. She is a certified Pro makeup artist who loves doing makeup and is highly passionate about it. She is adept at all types of makeup ranging from Bridal, Fashion, Editorials, Bodypainting and Prosthetics. Unlike other artists, they don't believe in the term- 'Regular makeup'. Hence, they only provide- 'High-quality HD' and 'Airbrush' makeup using the best international cosmetics, as they believe in providing the best to their clients. Customer satisfaction is their motto. They use high quality imported cosmetics from international brands like Anastasia, NARS, Urban Decay, Mac, Huda Beauty, Smashbox, NYX, Kylie, Benefit, Jacklyn Hill, Kryolan, Inglot, etc. It helps them ensure the best quality and long lasting HD makeup for their clients. Please feel free to contact Glamovers Makeup, Mumbai for bookings and for free trials. 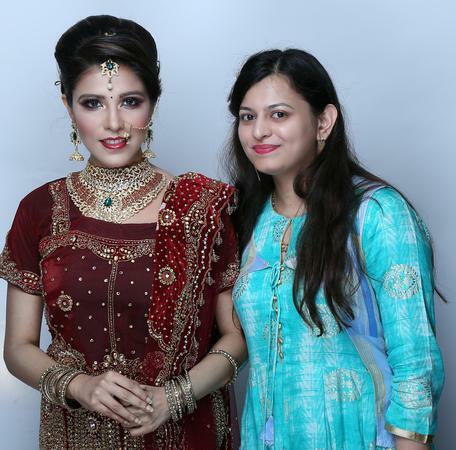 Glamovers Makeup Artistry is a Bridal Makeup Artist based out of Mumbai . Glamovers Makeup Artistry's telephone number is 76-66-77-88-99, Glamovers Makeup Artistry website address is https://www.glamovers.com, Facebook page is Glamovers Makeup Artistry and address is Goregaon East, Mumbai. In terms of pricing Glamovers Makeup Artistry offers various packages starting at Rs 12000/-. There are 0 albums here at Weddingz -- suggest you have a look. Call weddingz.in to book Glamovers Makeup Artistry at guaranteed prices and with peace of mind.